Subscribe to Chat Sports on YouTube to stay up to date on all MLB rumors and news! Yankees GM Brian Cashman spoke with reporters for about 20 minutes at the 2018 MLB GM Meetings at the Omni La Costa Resort & Spa on Monday afternoon. 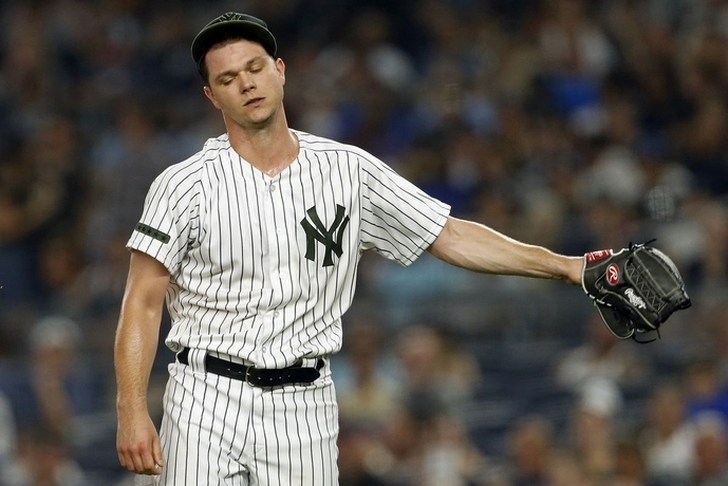 Cashman was asked about his starting pitcher Sonny Gray and the team's plans with trading him. It seems like Gray will be traded this offseason after a rough year where he appeared in 30 games, racked up 130.1 innings pitched with a 4.91 ERA. Cashman was also asked during the meeting the Yankees' biggest offseason priority. Only Luis Severino and Masahiro Tanaka are under contract to return next season. CC Sabathia and J.A. Happ each are free agents. So it isn't too big of a surprise to hear Cashman say the Bronx Bombers need pitching. One name that's circulating through the rumor mill is starting pitcher Corey Kluber. In fact, the Yankees are meeting with the Cleveland Indian today according to Jon Heyman. Kluber is 32 years old and a two time Cy Young Award winner (2014, 2017). He had another great year in 2018 posting a 2.89 ERA in 215 innings. Kluber has eclipsed the 200 inning mark in four straight seasons. A reliable innings eater like Kluber would be great for the Yankees. Cashman also added that the Yankees will look to add multiple starting pitchers. Not just one. James Paxton To The Bronx? The other pitcher that could be on the Yankees radar is left-hander James Paxton. Jeff Pason of Yahoo Sports reports, the Mariners are looking to rebuild their roster and make Paxton available. Paxton is coming off two great years posting a 2.98 ERA in 2017 and a 3.76 ERA in 2018. Paxton pitched a career-high 160.1 innings and could earn a starting role in the Bronx. The Yankees would love adding a lefty to their starting rotation, so don't be surprised to see the Bronx Bomber go after Paxton this offseason. Missing the latest Yankees news is like being a contact hitter that strikes out a lot. To make sure your baseball knowledge doesn't come from left field, download the Chat Sports Android App!